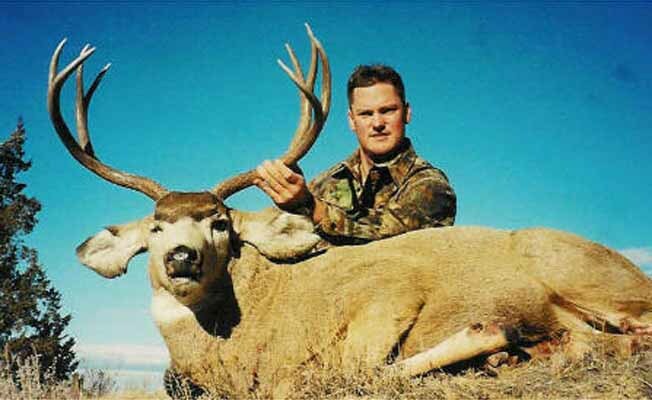 Southeastern Montana and the Powder River Breaks are known for the spectacular and abundant populations of wildlife --especially mule deer, white-tail, antelope and turkey populations. Broadus, MT is the county seat of Powder River County and boasts itself as being the wildlife capital of the world! Our hunts for both mule and whitetail deer take place on private ranches that encompass more than 100 sq. miles in and around Powder River County in Southeastern Montana. The hunting terrain is made up of steep, shale ridges with cedar and pine canyons. We also hunt on rolling hills and plains with more open canyons and draws. Early season hunts can be combination hunts or you may prefer to hunt just for trophy deer during the rut in November. We have 100% success rates on archery and rifle hunts. Mitchell Outfitting offers archery combo hunts for either mule deer and antelope or whitetail and antelope during the months of August and September. The miles of prime river bottoms offer the opportunity to take whitetail or mule deer from the same stands or blinds. We have had 100% shooting opportunities in past years with Pope and Young deer and antelope taken. Antelope hunts will be conducted from the water hole blinds or with decoys. This is a very game rich area with plenty of action possible. Mitchell Outfitting is run from our home in Broadus at 407 N. Rue, which is located in the center of our 7 ranch leases. Commercial flights into Billings, MT, Gillette, WY, and Rapid City, SD are available. Round trip transportation may be provided from the Gillette airport for a $100 fee and rental cars may also be reserved at the airports.Mitchell Outfitting is run from our home in Broadus at 407 N. Rue, which is located in the center of our 7 ranch leases. Commercial flights into Billings, MT, Gillette, WY, and Rapid City, SD are available. Round trip transportation may be provided from the Gillette airport for a $100 fee and rental cars may also be reserved at the airports.